The Celebration of Engagement is an annual and free event held to highlight the University's rich history of community partnerships. The USI mission states that community partnerships are at the core of our identity. 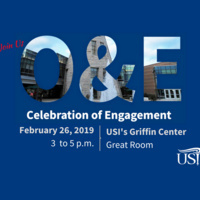 University of Southern Indiana Outreach and Engagement will host its fifth annual Celebration of Engagement from 3 to 5 p.m. Tuesday, February 26 in Griffin Center on the USI campus. The event will be hosted by Lifelong Learning, a division of Outreach and Engagement.